The organisers of the Great British Guitar Show have revealed details of the Live Stage line-up for the event, which takes place on 25-26 February at Birmingham's Bingley Hall. 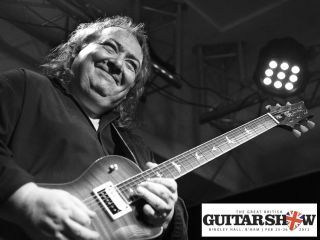 Ex-Whitesnake star Bernie Marsden, Irish blues-rock sensation Simon McBride and fast-rising shredder Andy James will appear alongside acoustic players Gordon Giltrap and the hotly-tipped Chris Woods. In addition, TC Electronic demonstrator Peter Jeppesen will be showing the new TonePrint pedals, Marshall's new range will be put through its paces by Chris George and Rotosound invites visitors to step up to the plate and duel with fast-fingered Haydn Hewitt. Show manager Jason Hunt said, "We're really pleased at the line-up for the first GBGS, featuring as it does some of the best talent the UK has to offer. Bernie is always a great draw and with his new PRS signature guitar just launched, we're really pleased to have him join us. He completes a group of artists that really do offer something for all visitors, whether they're fans of metal, blues or acoustic guitar playing." GBGS will also showcase the finest British guitar building talent, with Eternal Guitars, Cornell Amps, Overwater, Eve Guitars, Flame Guitars, Vanquish Guitars, Rob Williams, Patrick Eggle, JJ Guitars, Jaden Rose, Dave King and Beryl Guitars all confirmed to exhibit at the show.